Regularly eating guavas benefits your health as well as skin. Moreover, this fruit can be applied on skin to improve the skin texture. In addition, it works as a great natural skin toner. Besides, being rich in antioxidants, it helps fight visible signs of aging. Plus, it has astringent properties that are useful for fading blemishes and clearing acne. 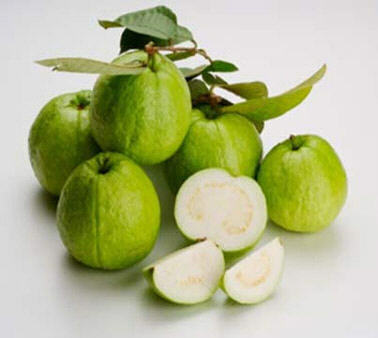 Guava is a good source of vitamin C, and it also contains vitamin A, vitamin b, vitamin K, beta carotene, iron, calcium, potassium, phosphorus, etc. 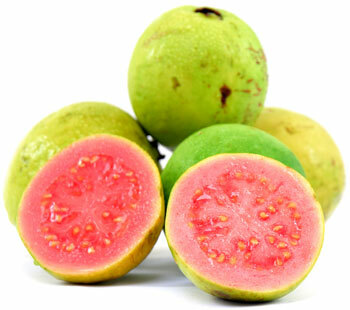 • Take a guava, cut into two halves and remove the seeds. Put the fruit in a blender or food processor and turn it on. Next, mix two teaspoons of ground oatmeal to form a thick paste. To enhance the astringent quality of this facial mask, you may add two to three tender guava leaves while blending the fruit. It helps heal acne and dark spots. In case you do not have oatmeal then use the same amount of milk powder. It is suggested to cleanse your face thoroughly with fresh orange juice and then apply this pack on the skin for about 10 minutes. Make sure you gently massage your face in circular motion while applying the paste. Follow this skin treatment once in a week. It also works as an anti-aging mask and reduces wrinkles. • Another similar beauty recipe for skin brightening involves blending pieces of guava fruit, two guava leaves, and two teaspoons of milk, and finally adding half a teaspoon of milk powder in it to form a paste. You need to slather this paste on your face and neck, and wash it off after 15 minutes. • Improve your skin tone and texture by applying a paste prepared by blending guava pulp along with banana. • To maintain soft, smooth skin, and remove blemishes, blend half a cup of carrots along with one guava (deseeded and cut into pieces) and add a little water while blending to get a thick paste. Next, add one teaspoon each of organic honey and lemon juice in the mixture. Leave the mask on your face for about 15-20 minutes and then rinse it off. • Another simple homemade facial mask to get glowing skin involves applying a mixture of mashed guava, ground oatmeal, and lime juice. In addition, you can make a facial scrub by mixing 10 g bletilla powder, a few drops of lemon essential oil, and a little water in mashed guava pulp. • Guava can be used to prepare a homemade lotion, too. For this, you need to blend two peeled guavas in a blender to get a puree. Next, melt half a cup of beeswax in a microwave or double boiler. Slowly add half a cup of olive oil in this mixture while stirring to get a smooth consistency. Finally, thoroughly mix the guava puree in it and again heat the recipe in a microwave or double boiler until it melts so that it is easier to pour the lotion in the container. This lotion can be stored and used within two months. • Application of guava leaf extract on your skin helps cure acne. Besides, you can apply juice extracted from guava leaves to heal wounds and bacterial infections on skin. Apart from applying guava for beauty, you can eat this healthy fruit to relieve problems like cough, cold, constipation, diarrhea, dysentery, stress, anxiety, and so on. Plus, it helps lower blood pressure, facilitate weight loss (due to high-fiber content), and treat scurvy. Besides, it is considered good for heart. In addition, this fruit is beneficial for lowering blood cholesterol and blood sugar levels.